Michałowski was born at an estate in Krzysztoforzyce outside Kraków, the son of landowner Józef Michałowski, senator in the Free City of Kraków. His artistic talent developed at an early age of 13 under the watchful eye of several artists including Michał Stachowicz, Józef Brodowski (1817) and Franciszek Lampi. He formally studied a broad range of subjects at the Jagiellonian University including classical philosophy, agriculture and mathematics. During the November Uprising against the Russian rulership, Michałowski helped run a Polish munition factory. To avoid capture, he escaped to Paris, France with his new wife Julia Ostrowska and her father. 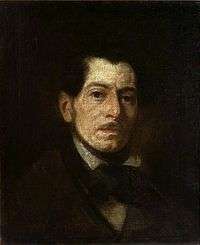 While in Paris, he continued his studies of painting and anatomy with Nicolas Toussaint Charlet (1832–1835), greatly influenced by the art of Théodore Géricault, Rembrandt and Velázquez. 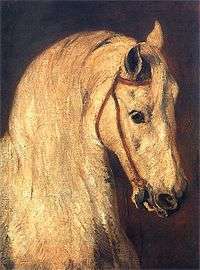 His watercolour studies of horses became very popular in France, sold by local art dealers since 1833 to English, German and American collectors. Michałowski returned to Kraków in 1835 and in 1837 settled into his family estate in Krzysztoforzyce. In the 1840s and 1850s he produced numerous equestrian paintings and dramatic landscapes including his famous Romantic "Battle of Somosierra" (1844–1855, several versions), "Parade before Napoleon" and other battle sites. When Pablo Picasso visited Poland in 1948, he saw Michałowski's work at the Warsaw National Museum and shouted, "Here, painter!" 1 2 3 4 Irena Kossowska (April 2004). "Piotr Michałowski". Culture.pl. Retrieved October 15, 2012. Wikimedia Commons has media related to Piotr Michałowski. Jerzy Sienkiewicz: Piotr Michałowski, Warsaw 1959, ed. "Auriga - Wydawnictwa Artystyczne i Filmowe" (Art and Film Publisher).